Sidharth was joined by Diana Penty at the Blenders Pride Fashion Tour 2018 event. 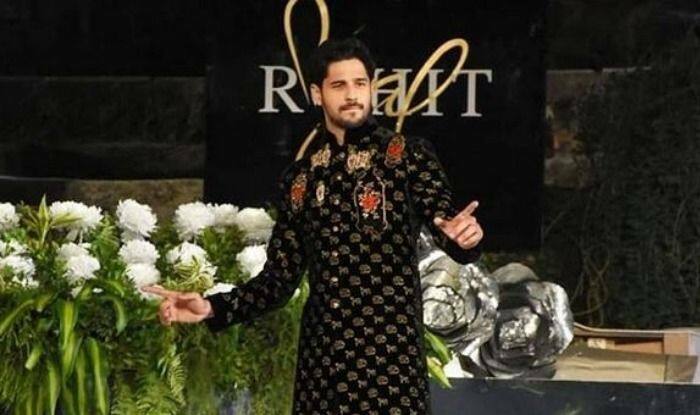 Actor Sidharth Malhotra was recently in the spotlight when he was almost upstaged by man’s best friend, a dog, while he walking the ramp for designer Rohit Bal. The video, which has gone viral, showed the dog weaving in among the models who were on the ramp, and even standing next to Sidharth as he was about to make his solo walk. The dog not only grabbed eyeballs, it managed to leave viewers amused. In the video, the dog could be seen casually walking around on the stage, before the authorities managed to chase it away. Sidharth was joined by Diana Penty at the Blenders Pride Fashion Tour 2018, and even though both looked regal in their outfits, it was the stray dog who ended up stealing the show. Watch the hilarious video for yourselves. “I think it was a really good show. I would say at least for men, he is one of the best designers we have in our country. He is designing different styles of clothes from many years. I think the kind of royal, regal and masculine touch he brings to his collection is really commendable,” he said. Walking the ramp aside, 34-year-old Sidharth was also asked if he had any plans on getting married soon. “I don’t have any plans for marriage as of now. Wedding season is not like a cricketing season which should be continued for an entire year. There is still a lot of time for my marriage to happen, but when it will happen, I will be ready for that in a Rohit Bal outfit,” he said. On the work front, Sidharth will next be seen in Jabariya Jodi with Parineeti Chopra and in Marjaavan along with Rakul Preet Singh, Riteish Deshmukh and Tara Sutaria.